Ask Hannah Thomas why she loves IU, and the public relations and advertising major at The Media School will tell you her love for the university is a family legacy that spans decades. Her father attended IU as a Groups Scholar, and her older sister was a student athlete here. But it is her grandma Mildred Morgan Ball's journey here and her continued commitment to her alma mater that really engrained Thomas' love affair with the campus. "I decided to come to IU when I was in the third grade, after watching my grandma receive the distinguished alumni award," said Thomas, a Hudson & Holland Scholar. "My younger brother and I attended the dinner and the president asked us if we were going to attend IU. Innocent, wide-eyed, third-grade me shook his hand and said yes! Little did I know 10 years later that I would call IU my second home." 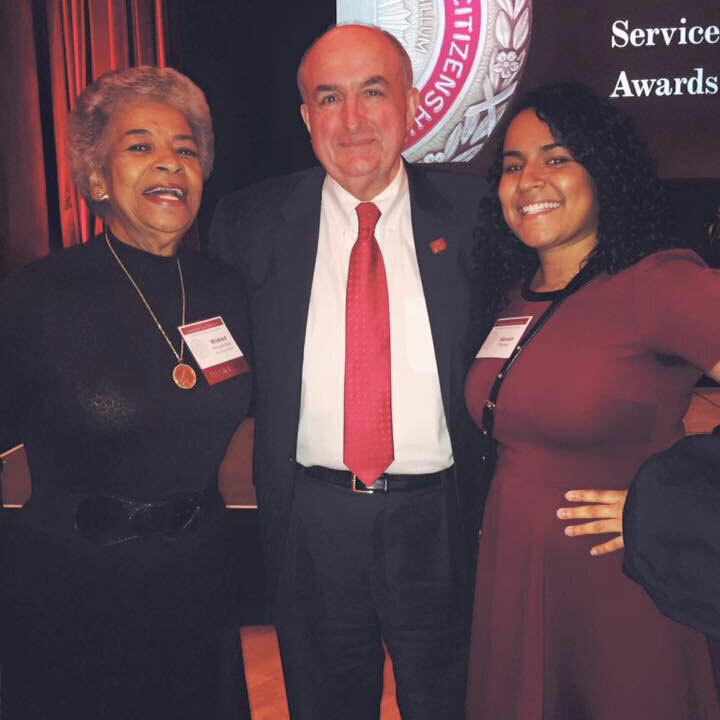 Thomas with her grandmother Mildred Morgan Ball and IU President Michael McRobbie at a more recent IU awards ceremony. Photo courtesy of Hannah Thomas. Born and raised in Indianapolis by a firefighter father and a mother who works for Visit Indy, Thomas grew up with a love for her city, a family who valued education and knowledge, and a desire to serve others. Thomas' passion for politics was spurred by watching Barack Obama become the first African-American president, developing a general love of debating and desiring to be the voice of people who don't have one. She is minoring in political science and interned for Indianapolis Mayor Joe Hogsett over the summer. Her interest lies more in helping create transparency between politicians and the public. Her dream job would be to work as a press secretary for the White House. "I'm really interested in communicating politics and policy to the public," she said. "There is such a need for transparency between the two, so people can be informed what is going on. I'm a big advocate for politics and public service." In addition to wanting to empower the public, Thomas also has a passion for global awareness and empowering women throughout the world. She is a founding member of Women & Co., which she and fellow Kelley School of Business students started in February. Thomas serves as the group's chief officer of global awareness. 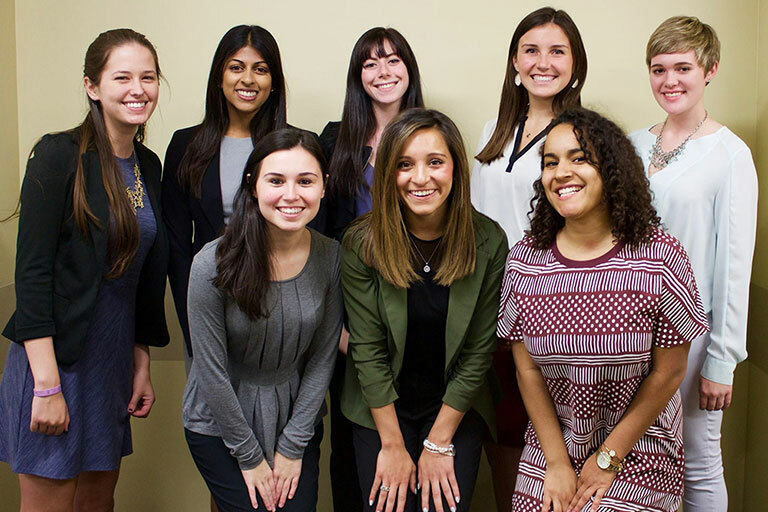 "Our organization is focused on women from throughout the university who are passionate about business and leadership," she said. "We want to not only empower women but work with men's organization to help create change for women in the workforce." Hannah Thomas poses with the executive board of Women and Co. Photo courtesy of Hannah Thomas. "To me, Women & Co. stands alone from so many other women's organizations because of what we represent," she said. "Yes we get together and have meetings and attend events around campus, but we focus on uniting diverse and driven women in a professional atmosphere that empowers women to uplift one another. And you don't just find that anywhere." Although Thomas has found her way in the past few years, she admits that, like many of her classmates, she struggled early on with the transition from high school student to a young adult trying to find her place in the world. 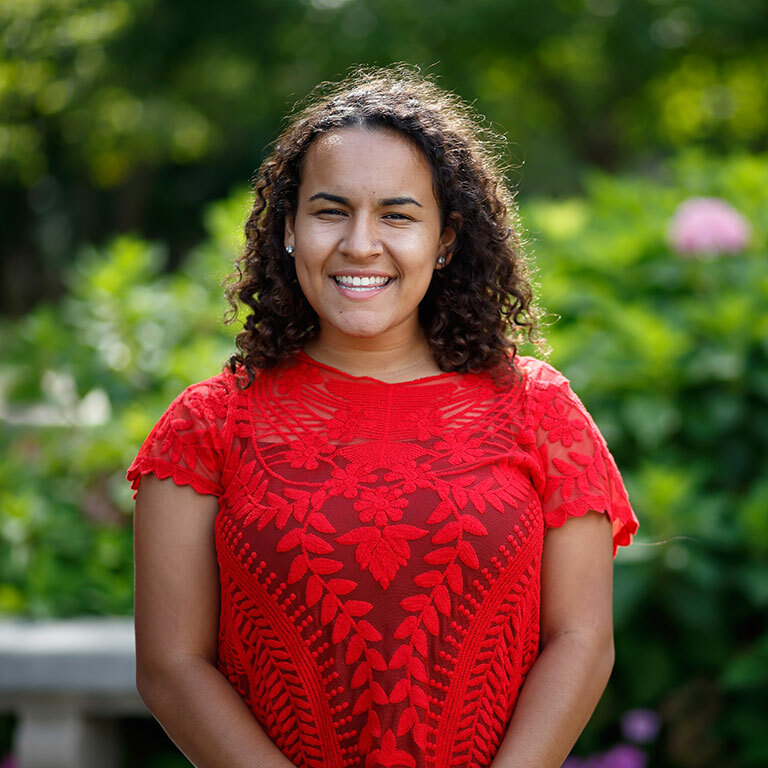 She even thought about leaving campus, until she attended an alumni event with her grandmother and heard her idol Sage Steele talk about her own struggles and eventual successes at IU. "I saw that video of Sage Steele talking about her journey here and I cried," she said. "I just knew that I had to stick around." Thomas eventually found her way and began to thrive at IU. She still counts the classmates she met during her freshman year at the Foster Harper residence hall as some of her best friends. And she cherishes the classmates she's met as part of IU Dance Marathon -- a fundraiser she participates in in honor of her brother Jacob, who passed away three months before Thomas was born. In addition to Steele, Thomas counts her grandmother as one of her biggest inspirations. Ball, who worked hard to pay for school and graduated in 1960, was a trailblazer in women's athletics and one of the co-founders of the Neal-Marshall Alumni Club. When a lack of transcripts from her brief time at the Hampton Institute in Virginia almost kept her from getting into IU, Ball persisted; she was admitted with the help of John Endwright, then assistant dean of what is now the IU School of Public Health-Bloomington, who heard Ball's pleas to receive an education. Hannah Thomas, a junior studying public relations and advertising. Photo by IU Communications. "It is so special to me to have the emotional connection I have to IU through my family," she said. "Being able to walk around campus and think about women like Sage Steele and my grandma and all they did for all women today -- the doors they opened for us is incredible." Thomas is inspired by stories of people like her grandmother who not only overcame obstacles and were persistent in receiving an education, but who have also made it their mission to give back. This semester Thomas will start a student fellowship with the IU Alumni Association. She looks forward to hearing more stories and passion for IU from Hoosier alumni. In the end it is the people, she said, who are at the heart of what IU is all about. "Watching my grandma over the years and her support for the School of Public Health and the university in general, I think it is important for people to give back to a university that gives them so much," she said. "I also love talking to people and hearing what drives them, how they came to be here. All of us has a journey that we are going through, and it's interesting to hear from people why they love the school and what brought them here."